my brother Max on July 13… this is where he got to celebrate his 60th birthday! weather: the worst so far – intermittent rain and a north wind put an edge on things! 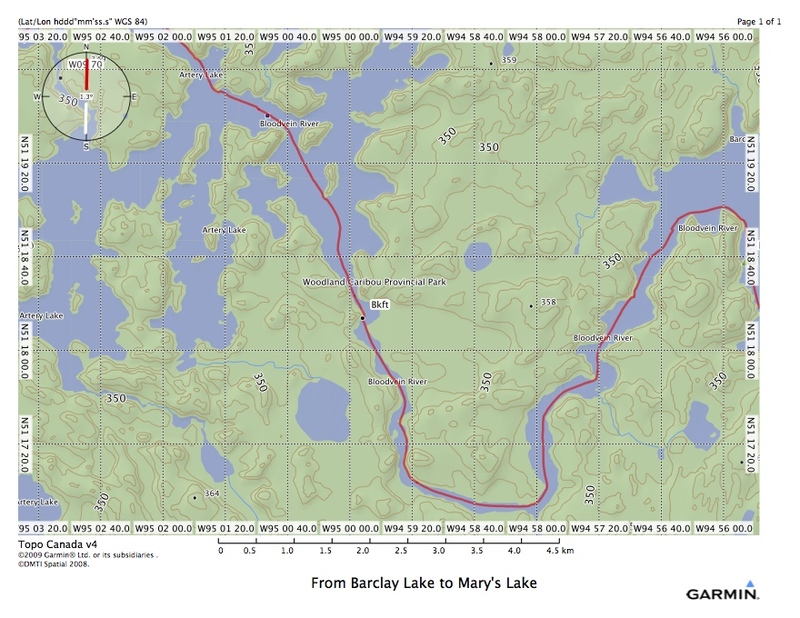 The plan had been to paddle up Barclay Lake and the Musclow River to the pictograph site near the top of the river; it was ten kilometers from our Day 5 campsite. A morning drizzle and spit which became rain with some North wind thrown in for good measure is what we had to deal with as we broke camp at the start of Day 6. We decided to pass up on the Musclow pictograph site and the twenty kilometer detour it would have required. There was also one portage that we’d have to do twice – once to get up there and once on the way back down. 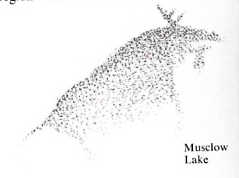 Included in our photocopied pages of Selwyn Dewdney’s book was a drawing of the one pictograph at the Musclow site – that of a moose. Given the weather and given the meagre reward, it seemed like a long way to go. Instead, if we just kept paddling down the Bloodvein we would be at the #1 pictograph site on the entire Bloodvein system in a few hours. So off we headed for the famed Artery Lake pictograph site. The Bloodvein took us southwest from Barclay Lake. The wind and drizzle hit our backs as we made our way to the bottom of the “U” that would take us back up to Mary’s Lake and then, after a short portage, into the narrow stretch of river leading to Artery Lake. But first another decision – yet another pictograph site! In a bay in the NE corner of Mary’s Lake, the Wilson map indicated a site of interest. Four kilometers up there on some pretty open water with rain and NW wind … We took a gorp and Bloodvein Nouveau break with Max kind enough to let me make the call. 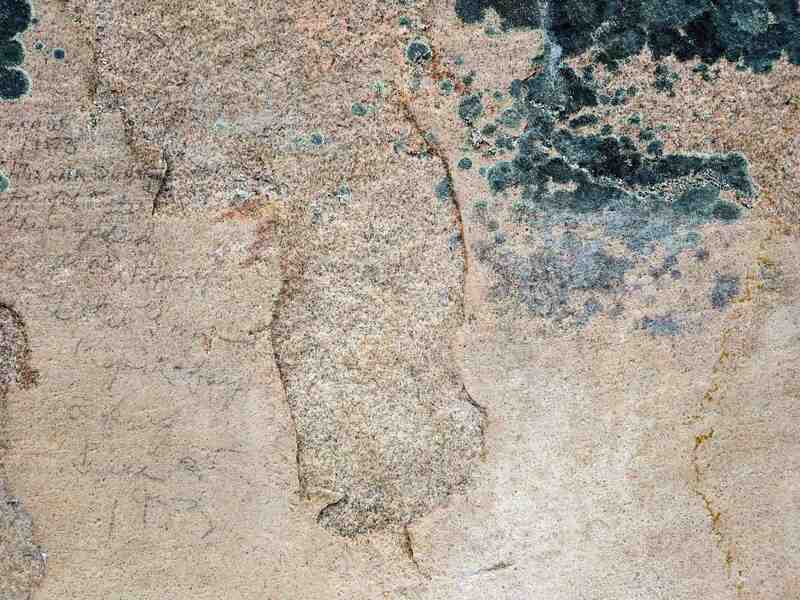 My good Roman Catholic upbringing reinforced with OCD (obsessive compulsive disorder) did serve up a generous serving of guilt about not getting done what I said I’d do – that is, seeing every single rock painting on the Bloodvein! 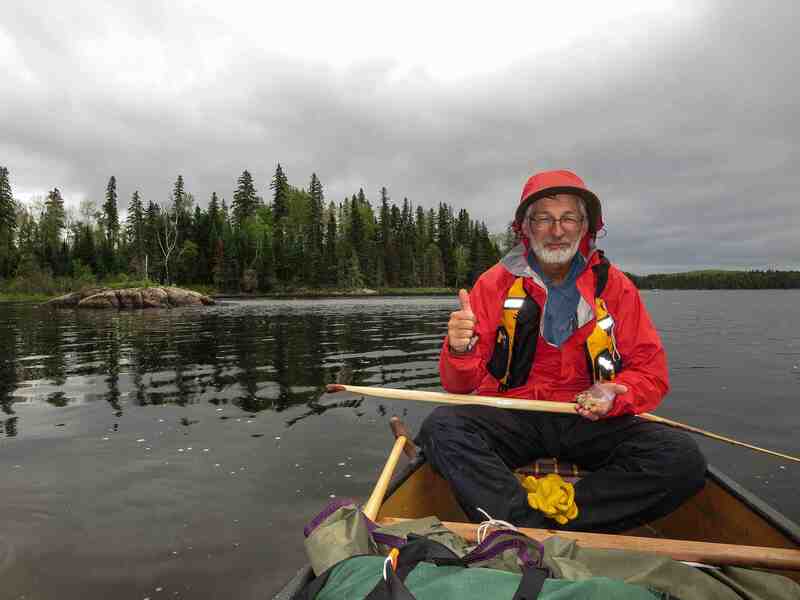 However, I turned around and said something like, “Max, the conditions right now -paddling four km. into the wind up to the end of the bay – a lot of work for god knows what…probably a very minor site. How about we pass this one up?” You can see his response in this post’s first image. Maybe there’ll be a next time! 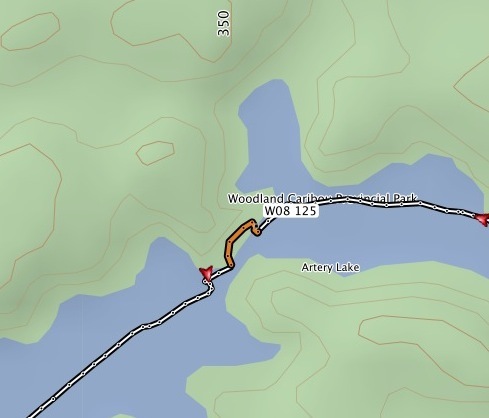 There was only one portage to do this day – that around W08. The pictograph site is another two kilometers down from there. 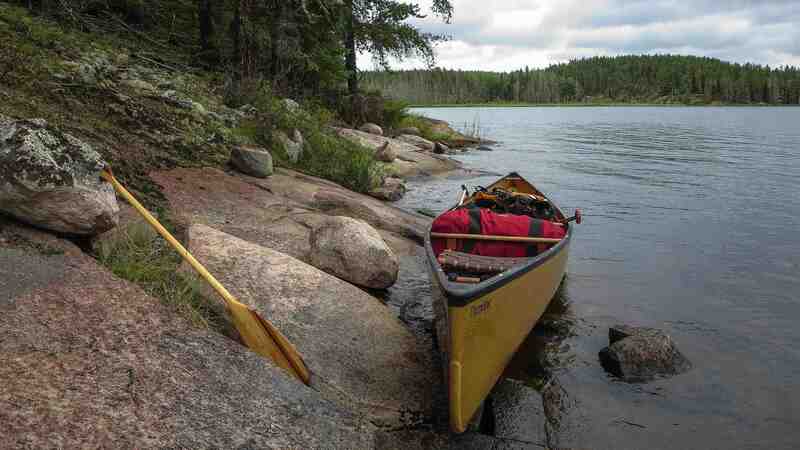 But first – the portage. Max put the video mode of his camera to use to show a real “pro” getting the job done. I know for a fact that the guy carrying the canoe (it weighs all of 42 lbs.) was just worried his no-grip L.L. Bean boots would slip on the moss-covered rock! As you will have noticed if you watched the video clip, the rain had stopped! In fact, except for the occasional drizzle it was mostly dry for the next four hours – long enough for us to visit the famous pictograph site, search for a second one, and get up our tent and tarp. 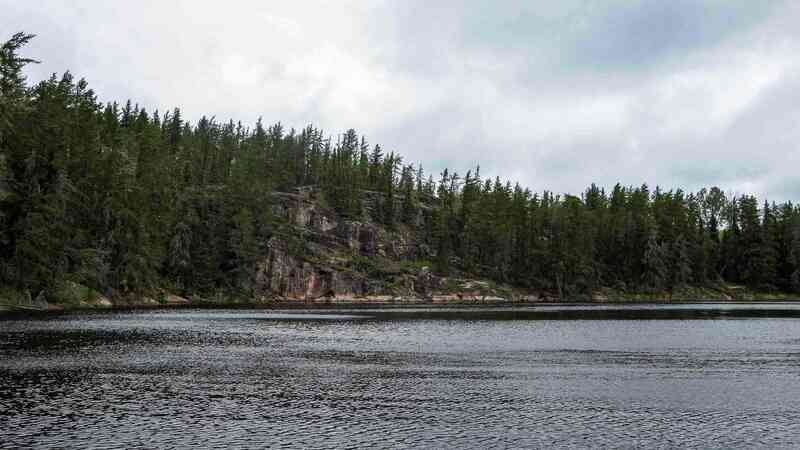 While the pictograph site between Murdock and Larus Lakes had been impressive (see here for some pix), this stretch of vertical granite at the east end of Artery Lake has one of the more famous pictograph faces of the entire Canadian Shield. The image above shows two of them side by side; Selwyn Dewdney labelled the one on the left “the Bloodvein shaman” and the one on the right “the Bloodvein bison”. Appreciating the turn in the weather, we spent some time here taking in the images and trying to figure out what they all meant. Without a doubt these images had a spiritual significance to those who put them there. Just as clear is that our paddling up to them three hundred years later elevated our canoe trip for a while to another level. We moved on a half-hour later, heading for the NE arm of Artery Lake and a reported pictograph site there. The pic below was taken from the point on the east side of the narrow entrance to this arm – we had pulled in there to stretch our legs and have a bite to eat. Up the arm we paddled, not really sure about what we’d find. 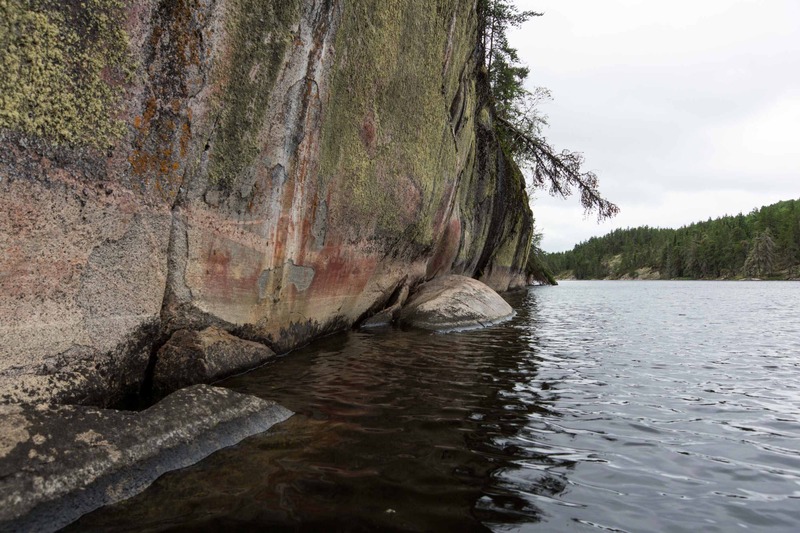 On the west side of the arm we paddled toward this rock face, thinking that it might be one that would meet a shaman’s requirements for a spirit rock where he might petition the maymaygwayshi (the underwater spirits who made the rock their home) for the medicine or other favour he needed. There really wasn’t another rock face like this on the west side so we were sure we were heading in the right direction. As at the main Artery Lake site we had been at a couple of hours before, there was evidence here of the flaking off of the surface rock face. 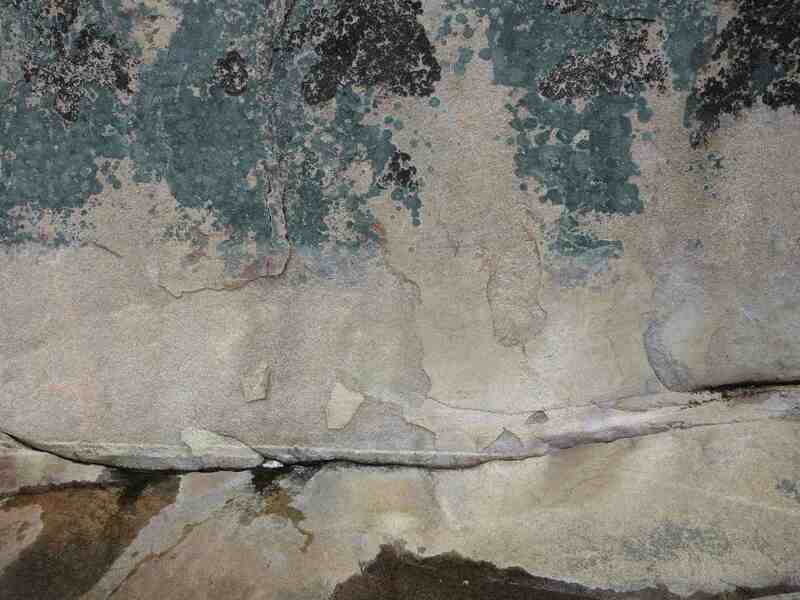 What we didn’t find was evidence of ochre on rock. 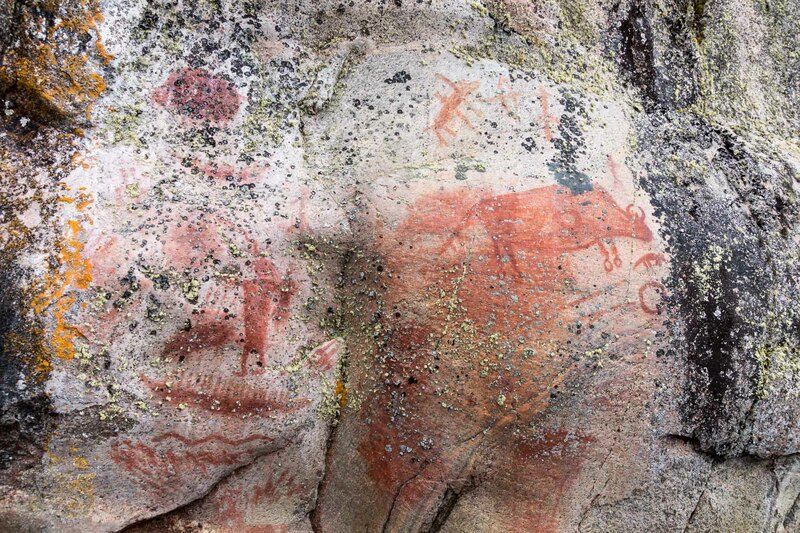 Perhaps any pictographs that had been here were on those pieces? The fact that someone had chosen this spot to scribble down their “Hey, everybody, I wuz here” notices (I think I am reading the numbers “1973” and “1983”) would seem to be an indication that there was something else here that drew them here – i.e. a pictograph or two. One of the weird things that happens if you stare at rock faces enough in search of pictographs is that you start seeing them everywhere. 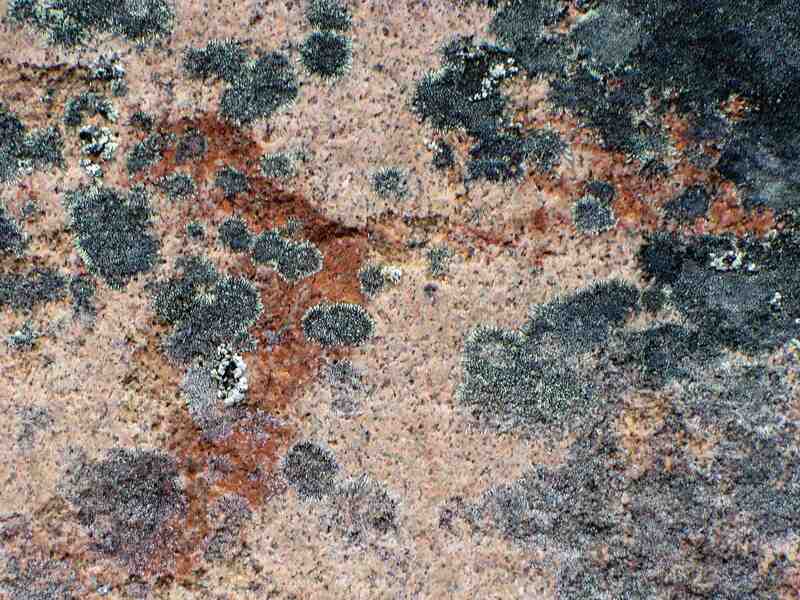 We called it “picto fever”; I’ll admit that I seemed to have a worse case of it than Max, who more than once went along with a detour knowing full well that there was nothing there that wasn’t a geological feature or rusty red lichen! Here is natural streak in the rock face that caught my eye from about forty feet away – I could have swore it was a human figure with outstretched arms! To make sure we hadn’t missed the actual site, we did end up paddling another 700 meters to the end of the arm but came up empty. Back down the west shore we paddled, checking other rock faces as we did so. No luck! By four our campsite located on a point was up; it sat almost at the middle of an Artery Lake which branches out in all four directions like a twisted cross. We had just gotten the tent and tarps up, when the rain started again. The reprieve of the past four hours was over. Now it came down steady and strong for the next few hours. From under the “dining room” tarp we watched as a couple, the first canoe trippers we had seen since Day 1, paddled east towards the pictograph site. If they got there without pulling over first to get out of the rain, their experience would be very different than ours. We had not really noticed any potential campsites as we had paddled west to our spot and we hoped that their outfitter had applied some accurate and nearby campsite markers to their map. Time to celebrate a birthday! Out came the bottle of brandy; combined with a Harvest Foodworks “Blueberry Crumble”. Bro, may you paddle ’til you’re 100! You will find the Parks Ontario 2015 map campsites map for all of WCPP here at the http://www.canoeng.com website. The above is just a small piece of it. 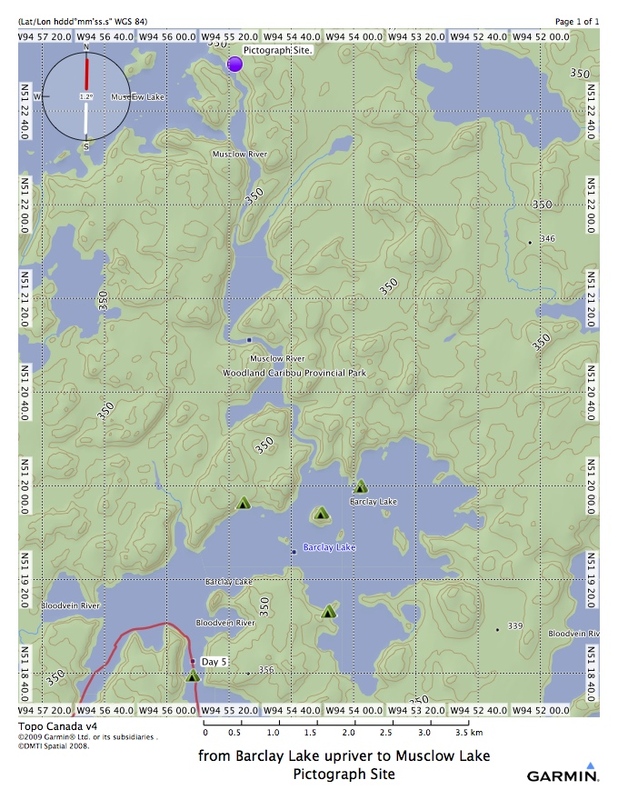 Open access to the campsite locations makes it easier for canoe trippers to plan their routes and it makes them less dependent on local outfitters for the information. Knowing where they are also encourages paddlers to choose established sites instead of setting up new ones perhaps 200 meters away from an already-existing one, thus reducing environmental impact. It makes no sense that the official park map – I guess that would now be the Chrismar map – does not indicate these sites.